Using multiple mat boards can add color, interest and dimension to your artwork or photography. 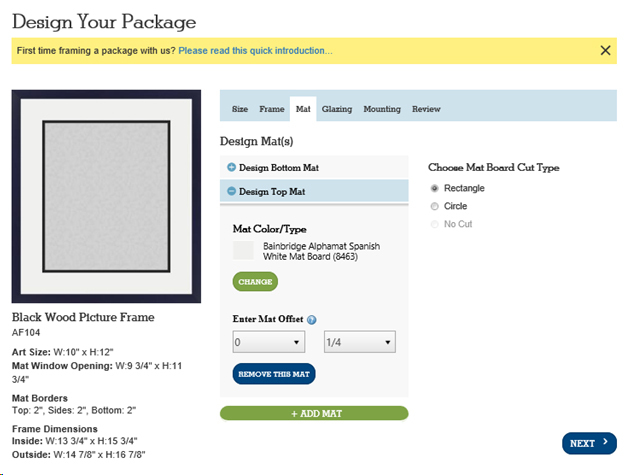 Our “Design Your Package” system allows you to easily create your multiple mat board design. 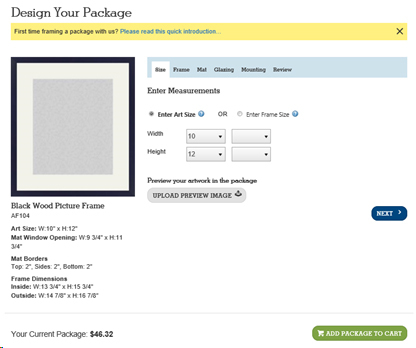 Once you have decided on your color combination, you can create your unique framing treatment with our framing engine. With this tool, you can experiment with different frame profiles or even upload a previous image of your artwork to see how it would look with your framing treatment. 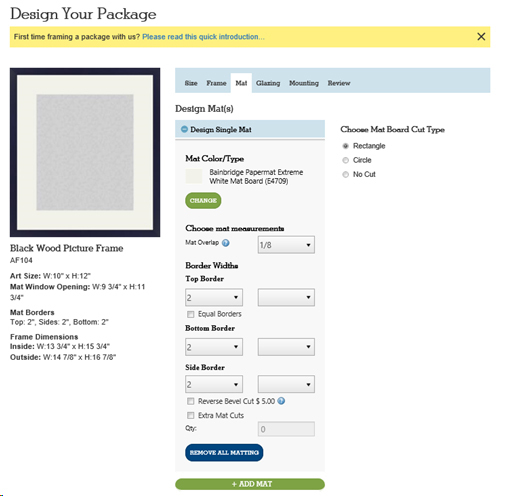 To start the framing engine, first browse picture frames from the picture frame tab, choose the one that best suits the artwork, then click “Customize this Frame” and the framing engine will automatically begin. Enter in your art size or frame size. Then, if you’d like to upload your own artwork to see how it would look in the frame treatment, choose “Upload Preview Image” from the “Size” tab and follow the prompts. If you’d like us to print and frame your work for you, click here. 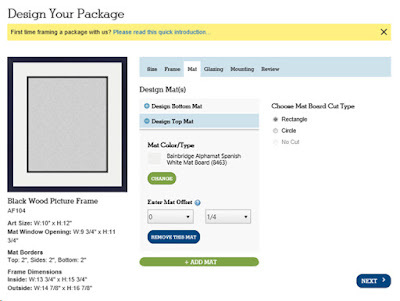 If you don’t want to preview the treatment with your own art, move onto choosing mats by clicking on the “Mat” tab. 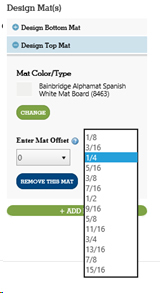 First, choose the mat board by clicking on the “Change” button. We have different types available (e.g., general purpose, conservation, 4 ply, 8 ply). From within the mat board type, choose a color. We opted for a black mat board with a black core. Next, choose your border sizes. We recommend 2” or more depending on the size of the work. Larger works may require wider borders. Keep in mind, the first mat board configured will become the bottom mat in your design. 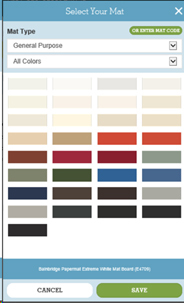 To add a mat on top of the first one, click “add mat.” Decide on the offset and then choose the color for the top mat. We chose a Spanish White 8463 to accent the black mat. If designing a triple mat, this second mat will become the middle mat and the third mat that is added will become the top mat. If you change your mind, you can click on “Remove This Mat” to eliminate mats. Once you are satisfied with your mat board treatment, you can continue choosing glazing, mounting, and accessories and complete the order. 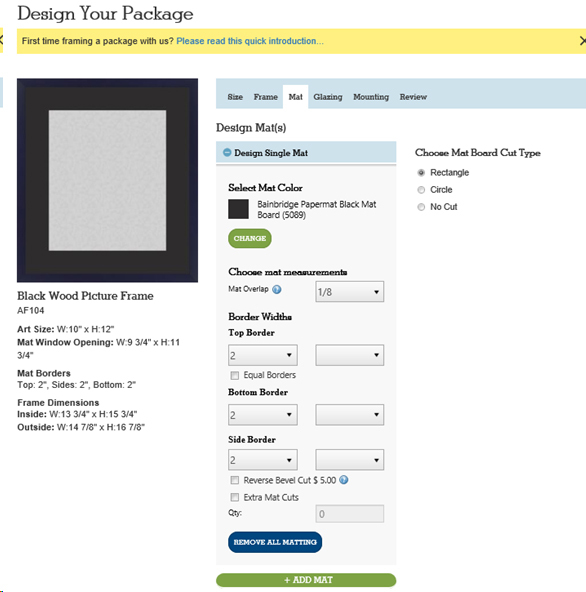 Finding the perfect mat board treatment might seem challenging, but with our “Design Your Package” tool, anybody can create a simple or complex framing treatment. Have questions? Our customer service team has answers. Contact us. I've never done a double mat but I feel like I should try one with my artwork now! I love the idea of having an accent color to compliment my work. I keep resuscitating your blog thinking, "For what reason are there no new posts??" Honestly, there are a couple of blogs I LOVE yet they don't have new substance reliably. On occasion it makes me forlorn. Diverse events it makes me hypochondriac. I go visit the point of arrival considering whether perhaps another post email essentially didn't come through (clearly that is never the situation). I'm not endeavoring to drive you to post every day, anyway the manner in which that I WANT you to infers that I really love the posts you do disseminate. I can't avoid in case I require more! Mat type framing can improve the beauty of the artwork or the photos. Also choosing this method, the fading of the artwork will be reduced when compared to the glossy finish ones. People have started opting this more and more. Now I know how can I create it. I can help you with first grade paper writing if you need. Feel free to ask me about it! I am going visit the point of arrival thinking about whether or not possibly every other submit Best Dissertation Help USA email essentially failed to come via genuinely that is by no means the state of affairs. Also deciding on this approach, the fading of the paintings can be decreased while compared to the glossy finish ones.